yes i did - why was it somewhat risky? According to Taylor there are no shorts on a Sell day. And as the Low was made first, have to wait for SS day to short. Even on a SS day the short has to be early on, if the high is being later , in this case also have to postpone the short for the high made first on a Buy day. ie. Taylor was against shorting late in the day. Your knowledge of Taylor is accurate. Having said that, today's markets are a bit different to what Taylor had to deal with. Now markets trade 24 hours a day and you dont have to be at the exchange to day trade. Most of us dont keep positions overnight and quick scalps are more popular then back then due to the big reduction in broker's fees. The computer age makes all this possible from the comfort of your own home or anywhere the internet is available. I too was very tempted to take that trade because of my TTT numbers and a DP at that level. I just hate trading the last hour of the day and specialy on Friday. One of you emailed me and asked me to do a review of the DAX for a few days. I will start with today. Today was a Buy day. The decline from the SS day high was shallow and should have taken us lower. 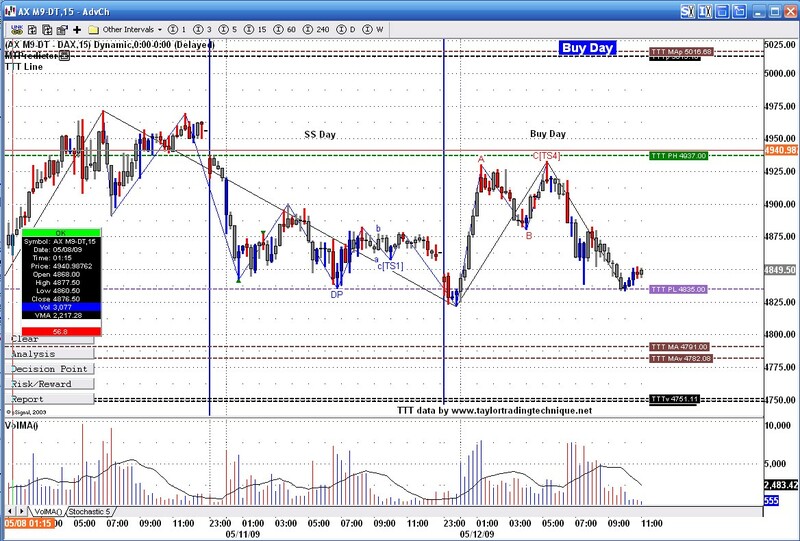 DAX gap down at open and tested the SS day low. Failing to get much lower it reversed and tested the highs of the SS day and failed there also. Failiure to take out the low or the high is often an indication they will try the opposite end. Which they did twice again on the low side. At morning i mean dax dont fill the Gap because the first 15 he dosent filled it and the efect should be TVGR. The way I look at TVGR, in this case, once we take out the high of the 2nd red bar TVGR is at risk, and the gap may get filled.